Webb was born June 15, 2006 in Walter Hill, Tennessee, which is an area about 30 miles outside of Nashville. 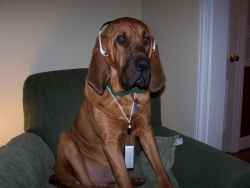 Webb is a full-blooded AKC registered Bloodhound. Our Country Music loving houngdog weighs over 100 lbs. He’s a big boy, expected to top out around 110 lbs. We’ve known Webb since he was about 4-weeks old. He was the most independent of his litter (a litter of eight) wandering off on his own in search of…whatever…usually trouble (but also likely Country Music news). His mother was a black and tan Bloodhound and his father was red, like Webb. Webb came to live with us in August of 2006 when he was 8 weeks old. One of his favorite pastimes, besides Country Music, is snatching towels, clothes, trash, etc. from places where his nose shouldn’t be, and then running away with it! 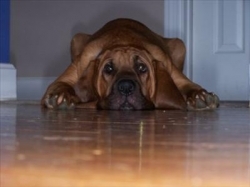 There’s a saying about Bloodhounds: “If their nose is on the ground their ears are closed.” It is very true. He also has a bad habit of putting just about anything he comes across in his mouth. This can cause problems, like the time he had emergency surgery to remove half of a tennis ball and a wash rag from his stomach! After a second “near-miss” incident when he swallowed something, we decided it would be best to have pet healthcare insurance on Webb. Besides enjoying Country Music, Webb likes playing with our other dog, Buddy (he is half Redbone Coonhound and half Walker Hound). Webb loves to eat, chew on bones, lay on the sofa, and is THE most affectionate dog I’ve ever known. We have to warn people that if they get near him though, they will likely get slimed. Bloodhounds are infamous for slobbering. We’ve read where they can actually sling it 10-20 feet when they shake their heads. There’s usually a treasure chest of goods tucked away in those big lips of his also. Enjoy the pics and video of Webb. Maybe one day you can have your picture taken with him, or run into him at CMA MusicFest, where he regularly visits with his Country Music fans. Webb loves other animals too. Recently he launched Webb's Paw of Fame, a showcase of the adorable dogs submitted by our loyal fans. Webb is also busy with his charity work, doing all he can to help the Nashville Humane Association and other animal care organizations. Want to send a message to Webb? You can email him at webb@countryhound.com. Also be sure to find Webb on Facebook and MySpace, and twitter with him on, well...Twitter!